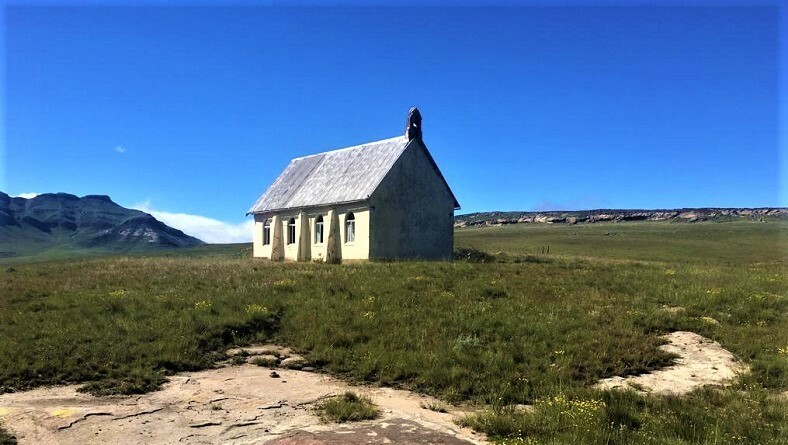 The farms have Scottish names – like Reedsdell with the area falling under the name of Wartrail - itself conjuring up images of distant wars and skirmishes between Zulu, Xhosa, Boer and Brit. The distance passes in a maze of perfect scenery, but ahead the Drakensberg looms and the prospect of tackling Lundins Nek Pass (Lundeans Nek) is on everyone's mind. The road begins deteriorating and soon the convoy is instructed to switch to low range. Deep ruts and washaways interspersed with small rivulets and teeth chattering rocks slow the speed down to under 15 kph. The halfway mark in any challenge is where emotions begin running high and calmness needs to be instilled. The tyre shop (Supa Quick) in Elliot were brilliant. They had sourced the correct sized tyres for the Land Rover in Queenstown and loaned their company bakkie to Anwar, who was back by 4.30 with the new tyres. Fitted, balanced and ready for Day 3. We needed to recover Francois’ motorcycle, so some major changes had to be made. Mike, Richard, Francois and 2 helpers from the hotel left early in the Land Cruiser bakkie with recovery gear to recover the bike, still marooned at the summit of Bastervoetpad Pass. Our forecast for the day was 75% rain, so there was a sense of urgency in getting that side of the operation completed. That meant Group Romeo had to absorb the rest of Group Mike, bringing our convoy size to 12 vehicles. Our route for the day was down Barkly Pass (never boring no matter how many times you drive it), then north-east to Ugie, Maclear, Katkop Pass, Moordenaarsnek Pass (all on tar), then onto gravel up Luzi Poort, Pitseng Pass and on to the 6th challenge pass – the magnificent Naude’s Nek Pass. Roadworks at the lower end of Naude’s Nek pass weren’t really any problem and the local truck drivers all allowed our big convoy to pass them in a courteous manner. Things are still beautifully old-school in the Eastern Cape. 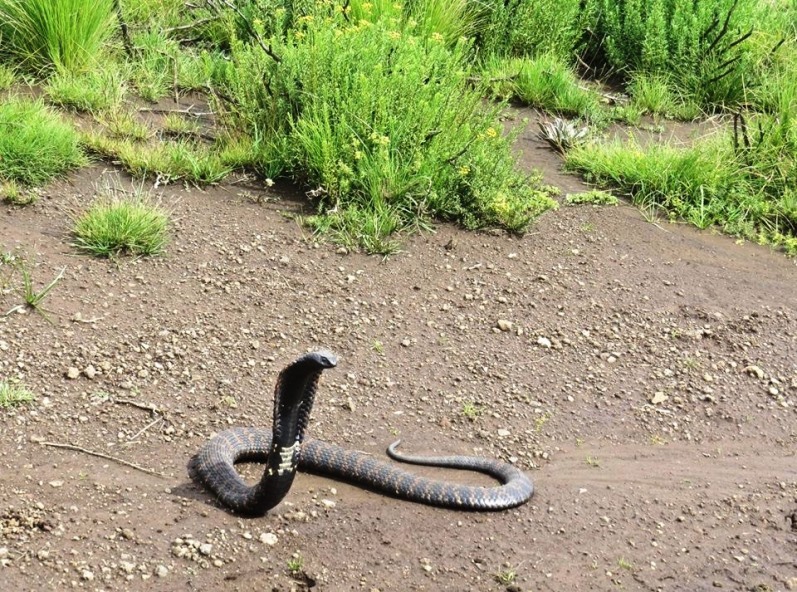 Naude’s Nek is a magnificent pass with fascinating history. Eventually the entire convoy was parked off at the main view point at 2500m ASL. Selfie time and a good leg stretch before we tackle the second part of the day. Naude’s Nek is frequently touted as the highest altitude pass in South Africa at 2590m. 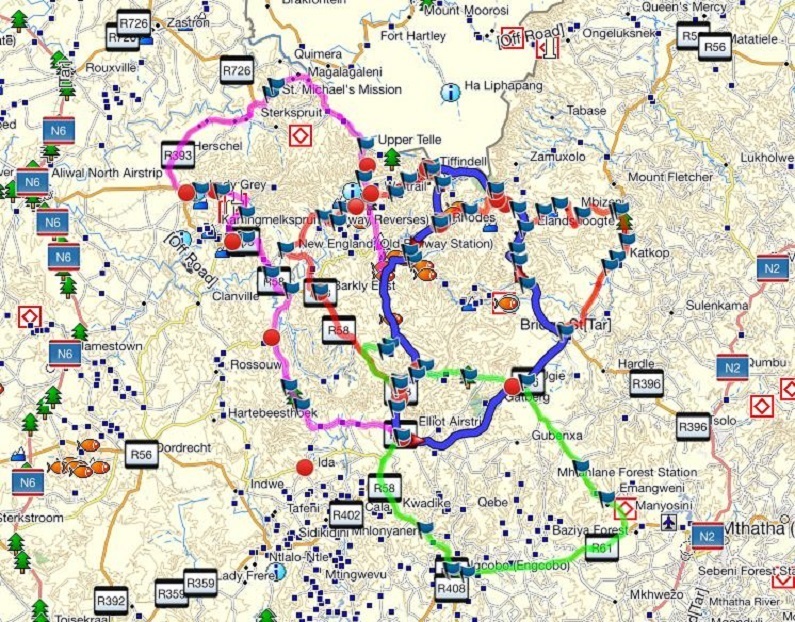 It is in fact the 4th highest pass, being pipped by Ben MacDhui, Sani Pass and the TTT in that order. It’s also a very long pass at 32.7 km, but the road is fairly wide and reasonably easy to drive. The views throughout are lovely and we were fortunate to have a clear day allowing for reasonable photographic opportunities. Our lunch break was taken at the Naude family memorial site, set under shady oak trees near a clear stream. Next up was Carlisleshoekspruit Pass. This pass involves a lovely drive up a long valley crossing the stream a few times via concrete dips or small bridges. Little did we know that 24 hours later this peaceful valley would turn into a mass of flood water. 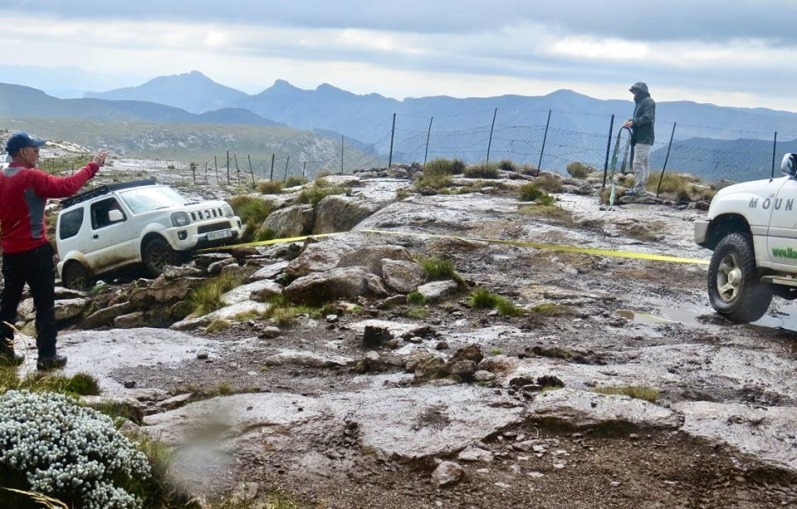 The steepest parts of this pass are concreted, which require a specific driving style and 4x4’s cannot use low range without the risk of damaging their differentials. This means selecting 1st gear high range and maintaining some momentum around the hairpin bends to prevent stalling. Next up is a long, slow drive past Loch Ness and over the mountain plateau to reach the 8th challenge pass – Volunteershoek. This pass is not good for bikers, as they battle with all the loose stones. The road is maintained privately by the Wartrail farmers. Old tyres have been filled with sand and these seem to be effective in keeping the bad sections stable. Our last point of interest for the day is a visit to Loch Bridge. A beautifully designed Joseph Newey bridge over the Kraai River. From the descent the rail reverses 6, 7 and 8 can be clearly seen. These are apparently only found in South Africa and Canada - a cheaper option than a long tunnel. Another long and tiring day, but successful and without mishap. Eight done. Two to go. Chapter 15 / Day 4 – Supposedly the easiest day. To ensure that everyone in the bike recovery team completes the challenge, Mike leads just the one extra vehicle (Richard in the Land Cruiser bakkie) and has Francois and his wife as passengers in the Everest. They will attempt to do 5 challenge passes in one day. They will need to start early as that is a tall order, but with only two vehicles, the speed will be much faster than the bigger convoy. The plan is to meet up with Group Romeo at Tiffindell and everyone drives back to Mountain Shadows together. Group Romeo have an easy run as per day 3 as far as Maclear, where we turn off onto gravel and drive the Pot River Pass, Elandshoogte and again climb the southern ascent of Naude’s Nek Pass. All is going well, but there are tall cumulo-nimbus thunderheads building. Huge billowing masses towering thousands of feet into the sky and getting darker by the minute. 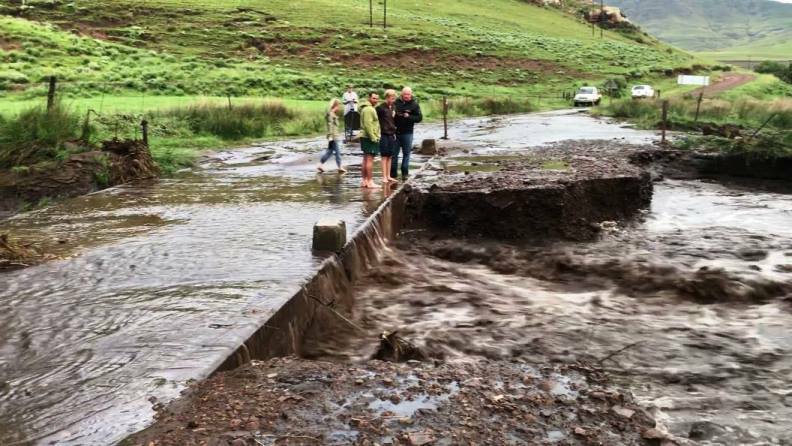 Little did we know that this huge storm system had come all the way down the Drakensberg from Bloemfontein causing major damage to roads and infrastructure in its path. From the viewpoint we keep right and take the road past the attractively sited Tenahead Lodge (expensive, but classy without being ostentatious). Next up is the 9th challenge pass – The Tenahead-Tiffindell-Traverse. 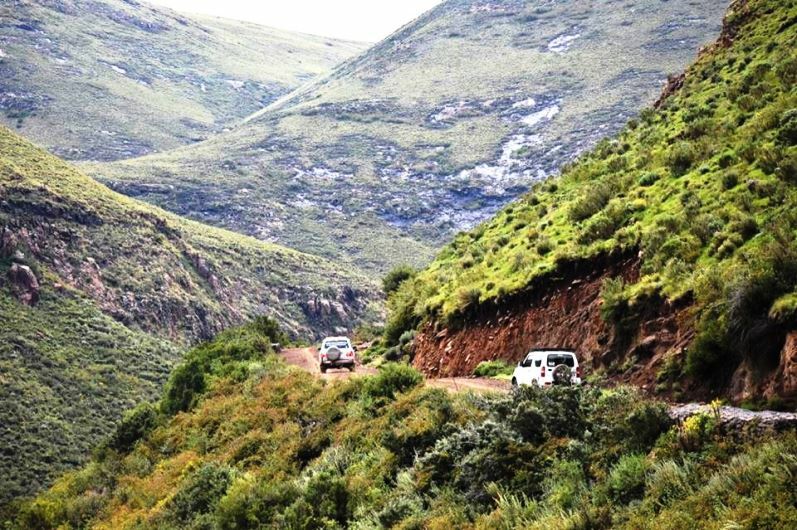 A 27 km long contour road built specifically to combat stock theft into Lesotho. It’s also known as the Cairntoul Road or Die Patrollie Pad or Grenspad. It’s a slow, bumpy drive that takes us two and a quarter hours. We see a rinkhals on the roadside, which has its hood spread, black eyes focused and it remains in that pose for at least 6 vehicles to photograph it. By the time we reach the 20 km mark on the TTT the skies are dark and its only 12.30. There is a big storm brewing. It starts raining and those tasked with opening and closing the gates are getting wet. We get to Tiffindell Ski Resort at 1.30pm and decide to take the convoy straight up to Ben MacDhui as quickly as we can, as if this storm breaks, it’s going to be too dangerous. It’s raining already, but not too hard. Ben MacDhui Pass is fairly short, but it is very steep and quickly deteriorates when wet. The whole convoy makes it up without any issues. Graham Adie and Anwar (both runners) have decided to run/walk up. Anwar records his heart rate at 178 bpm. The air is thin. Near the actual summit point are four obstacles to clear. Everyone clears them without problems, but the final little climb up to the summit plateau is in a bad shape. For the second time I deploy the front locker and the Land Cruiser is up at the summit beacon. Ben 10 done and dusted. Behind us is the little Suzuki Jimny. Big loose rocks and mud prove to be too much and the Jimny is stuck. In the meantime the skies have begun rumbling and bolts of lightning are crackling down around us. The rain increases and suddenly it starts hailing – right in the process of recovering the Jimny. We do a reverse recovery of the Jimny and the 2nd vehicle is now up. Ten to go. Next up is the Land Rover, but the driver decides not to tackle the obstacle and pulls aside. The third vehicle is up is team Whisky Papa in the Patrol which get up with ease. They are followed by the Halls in a 200 series Land Cruiser and they in turn are followed by the Fortuner of Jacobus Smith who also makes it up unassisted. Each climb is making the obstacle progressively worse. We now have 5 up. Next is a 76 series Land Cruiser and it hooks a big rock under the rear leaf spring. The storm is getting worse. Hail is pelting down. A lightning bolt hits the fence a few metres from where we are, sending sparks flying. The situation is deteriorating rapidly. Chapter 17 / Day 4 – Ben MacDhui Pass - Safety first. Trying to do road building with lightning and hail around you is not the easiest of tasks. After some effort we get the 76 Cruiser reversed back down to the bottom of the obstacle. 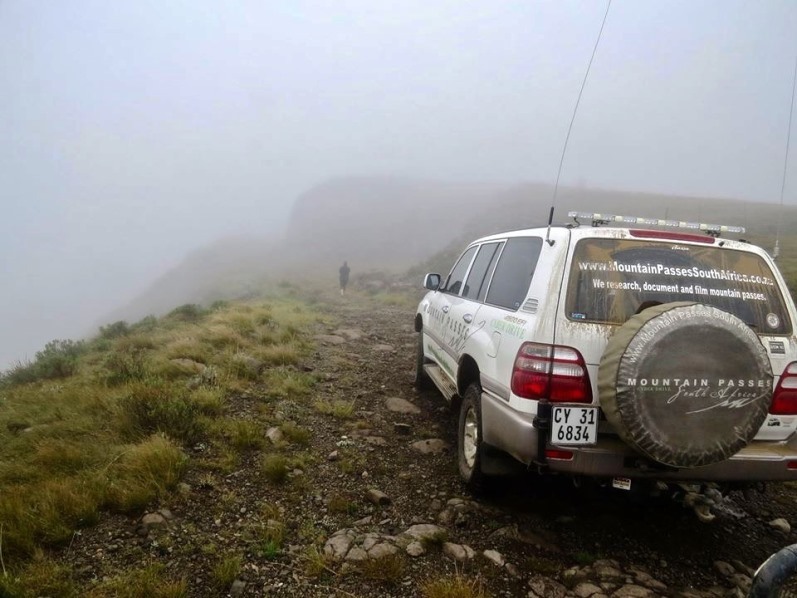 A safety decision is made not to take the rest of the convoy to the summit. 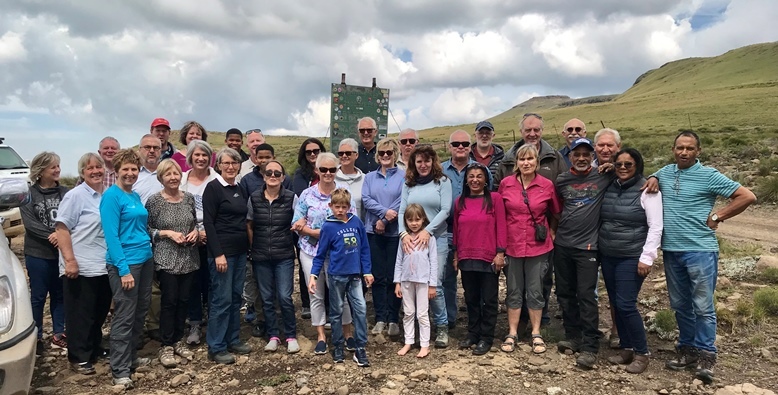 Drivers are requested to quickly walk to the beacon and take their selfies, then get into their vehicles and drive back down to Tiffindell in the reverse order. Halfway down the switchbacks the Land Rover slides to the left with both its left wheels in a ditch and is unable to drive out. We are directly behind it and attempt to give advice to the driver. It soon becomes apparent, that the Land Rover will need to be recovered. The 76 Land Cruiser, which is ahead of the Land Rover, is requested to reverse back up the slope and through the hairpin to effect the tow recovery. With some difficulty, we finally have the Land Rover back on the road and the whole convoy makes it back to Tiffindell. The management of Tiffindell have laid on tea, coffee, cheese and biscuits and cakes for all of us. What a treat. It’s well past lunch time, so the team are hungry. The Ben 10 has been successfully completed. There is a sense of elation. Mike and his team have also arrived after driving their last pass (the TTT) through heavy storm conditions. Our goal has been achieved. All that remains is the easy drive back to Mountain Shadows Hotel via the Carlisleshoekspruit Pass, Rhodes and the Bokspruit Pass. Little did we know that our biggest challenge still lay ahead, which would turn the tour on its head. We left Tiffindell in high spirits at about 3.30 pm. We put group Mike in the front of the convoy, followed by group Romeo, maintaining the same driving order. On the high grounds below Tiffindell it looked like it had been snowing, bit it was hail – vast amounts of it. The convoy, now back to full strength of 14 vehicles, trundled slowly down Carlisleshoekspruit Pass in 1st gear high range. The rain continued and got heavier. Great bolts of lightening lit up the darkened sky and deafening peals of thunder echoed down the valley. For those of us from Cape Town, unaccustomed to electrical storms, it was intimidating. Halfway down the pass, a small waterfall can usually be seen on the far side of the valley. It has a vertical drop of around 80m. Now there is a wide torrent of brown water thundering over the lip in a furious cascade of spray. This was the first warning of trouble on the way. Mike arrived at the first causeway - a concrete low level bridge which was submerged with a strong current running over it. Mike called me on the radio advising of the situation. He felt he could drive safely through. I told him to make his own judgment call. He crossed without any issues, as did the Land Cruiser bakkie. We were next and again a fairly no nonsense crossing, but I was concerned about the little Suzuki Jimny. I called Casper (the Jimny driver) on the radio and suggested that he think carefully about whether to cross or wait and that the decision would be entirely his own. The Jimny crossed without any problems. I radio’d the rest of the convoy stating that the Jimny would be the scratch vehicle and if it made it across, all the others would manage as well. What we didn’t know, was that we were proceeding into a worsening situation where the river levels would rise dramatically within the space of a few minutes. Chapter 19 / Day 4 – Drama, Drama, Drama! As we drove down the Carlisleshoekspruit Valley we crossed another two side streams of the main river. Whilst they were flowing swiftly, the crossings were short and relatively easy. The second one looked nasty as the water was almost black. Again I urged the JImny driver directly behind me to carefully consider his safety, but the Jimny crossed without a problem. 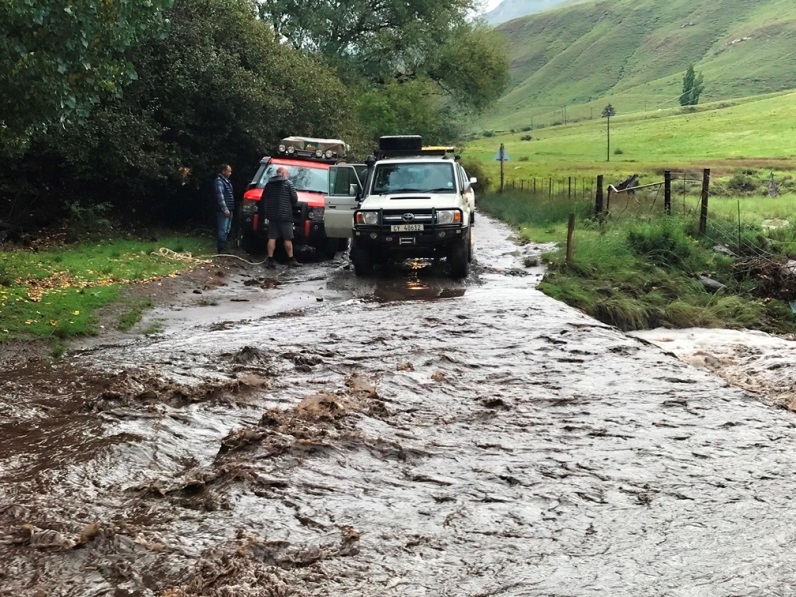 A gap had opened up between the Jimny and the next vehicle – the Land Rover, and in those few minutes the black stream had risen by another half a metre, escalating it into the dangerous level. Those at the back of the convoy were urging the Land Rover driver to proceed, but the crossing went pear shaped, with water rushing up and over the Land Rover’s bonnet up to windscreen level. At that point the engine cut out mid-stream and the 3 ton vehicle started sliding sideways towards a 2 metre drop on the left. We received an anxious radio call from the vehicles behind. At that stage we were more than 2 km ahead and had to turn around and rush back to the stream. I also called Mike and Richard to turn back to assist. By the time we got back, the Patrol had managed to get a rope onto the Land Rover’s towbar and pulled them back to safety. The four occupants were visibly shaken. Whilst we were trying to figure out a Plan B, the river just as quickly started dropping and within 15 minutes the 76 Cruiser was able to tow the Land Rover over the crossing. The Land Rover was soaked to the core - all its electronics dead. But there was yet worse news waiting up ahead. Chapter 20 / Day 4 – The bridge is gone! The ebullient mood of our group had changed to one of angst and concern. 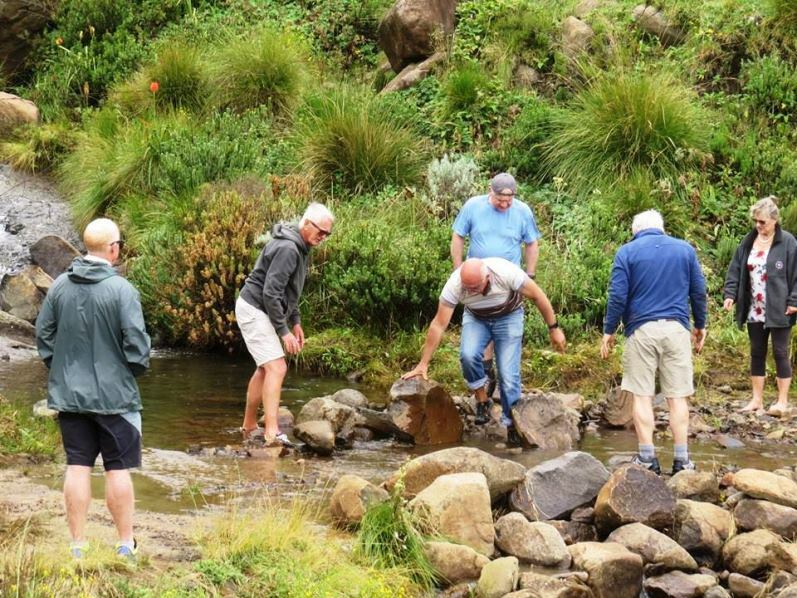 Two kilometres down the road at the next farm, Mike called us to advise that the bridge was completely submerged and probably had been washed away. 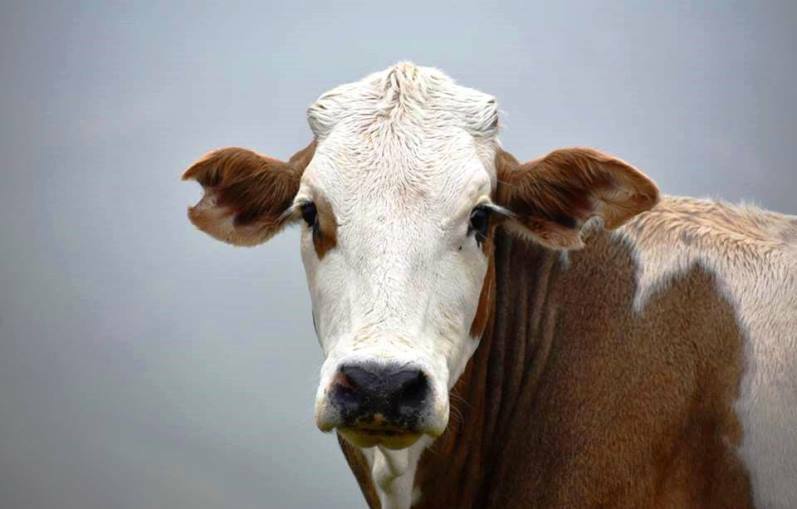 A dead cow came floating down in the raging torrent. Trying to cross the river would have been suicidal. The water levels were still rising and soon the big barn next to the river was completely surrounded by water. We started moving our vehicles to higher ground. On the far side of the river were two vehicles. These belonged to the owner of the farm. We managed to get the phone number from one of his workers on our side of the river (thanks to the foresight of our IT expert - Jacobus Smith). Luckily the farm was just within mobile reception range. The farmer told me to relax and wait and that the river would subside within an hour. 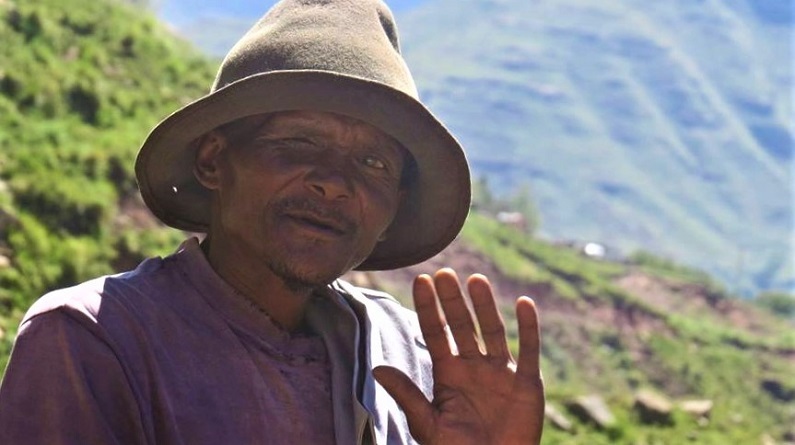 Moral of the story is – always listen to the farmers! Fifteen minutes later it was as if a miracle occurred. The river dropped rapidly, revealing the old bridge, which had been damaged in a flood a few months prior and declared unsafe as its foundations and support columns had been swept away . A temporary bridge had been built alongside and which we had driven over the day before. That temporary bridge was now completely gone. The four concrete pipes were visible some distance downstream. It was getting dark. We had hungry kids and fearful adults to contend with. A really difficult situation. As always safety has to be the first priority. Chapter 21 / Day 4 – Decisions, Decisions. We got our civil engineer, Mark Ilbury, down to the bridge to get his opinion on safety versus risk. Earlier the farmer had fitted metal scaffolding jacks under the bridge to support the middle section. These had now also washed away leaving the bridge weak and unsupported. To the naked eye, the bridge looked solid. The decision was to sleep in our cars and head back early the next day via the TTT or Volunteershoek. At that stage we were unaware that the same storm had washed the road away at Mosheses Ford. Another alternative was to head back to Tiffindell and get accommodation there for the night. That would mean having to recross all the rivers once more. Mark advised that the bridge was designed to carry 30 tons. Our heaviest vehicle was 3 tons. Therefore the chances of the bridge collapsing was actually very small. If it did, it would crack and subside but not break catastrophically. We made a decision that the risk was worth taking and Mike volunteered to cross first. One by one and with bated breath we got everyone across safely, except the Land Rover, which had well and truly drowned. Mark, who was driving solo in a 200 series Land Cruiser, was able to take all 4 the Land Rover passengers and so we headed towards Rhodes minus one vehicle. It looked like we were getting the Ben 12 rather than the Ben 10!!! I tasked Eugene with driving with his lights off to conserve battery energy to power the fuel pump. To add to his dilemma it was also raining quite hard, which meant without wipers he would be struggling to see. The vehicle behind (Hendrik) volunteered to drive close behind him (offset to the right) with his lights on bright to light the way. The vehicle ahead of him would keep a constant distance ahead of him to help him gauge which way the road was bending and the same distance ahead of them, we were able to mark the way by putting on our rooftop orange emergency strobe lights. 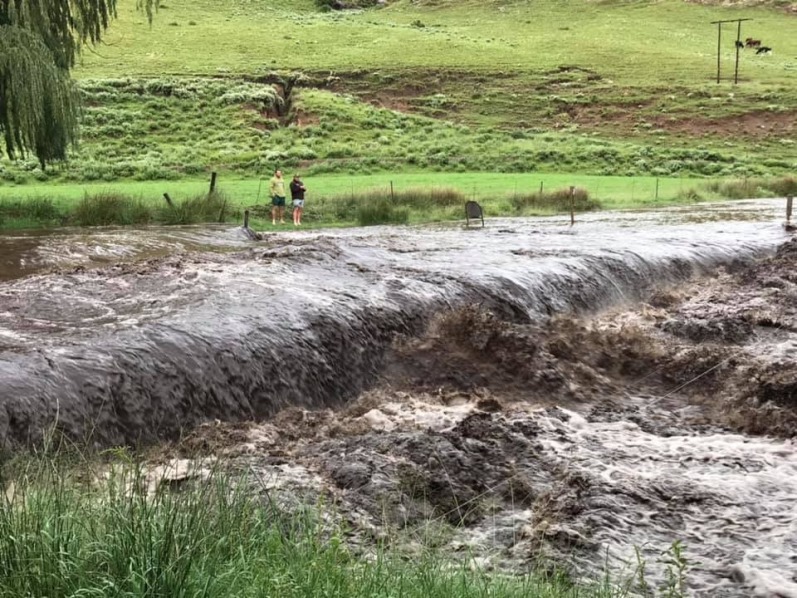 The farmer called to advise that the road at Mosheses Ford had washed away and advised to return via Bokspruit. The storm was still raging with more hail and rain making the night exceptionally dark and the roads were dangerously slippery. It limited our speed to 40 kph. And so we limped back towards Mountain Shadows Hotel almost 80 km away via the Bokspruit Pass. The 2 way radios helped enormously in keeping communications open and ensuring everyone’s safety. I had been able to make telephonic contact with the owner of the hotel – the ever bright and helpful Ria, who promised to wait for us and keep the bar and kitchen open (in that order!) We arrived at 10 pm. The last supper was good. Casper ordered medicine for the team – a round of Jagermeisters. An impromptu final speech praised all of the challengers from the youngest (Tinneke - who by the way celebrated her birthday where the entire group and hotel staff serenaded her Happy Birthday song in English and Xhosa) to our driving champ Eugene, who had nursed his Isuzu all the way from Rhodes under the most arduous conditions. Everyone received their Ben 10 badges. Earned the hard and honest way. What was interesting about this group of 36 people (of whom two were on holiday in SA from Plymouth in the UK) was that they started the tour as strangers, but it was the hardships and drama, that brought out the best in everyone, which ensured each person was able to complete the Ben 10 Eco Challenge. To have the privilege of leading this tour was a complete restoration of my faith in the human race and the purity and good values which are still out there in abundance. The Isuzu made it to Aliwal North the next day where the agents were unable to supply an alternator. Eugene bought a second battery as a back up to ensure he would make it home to Pretoria. As things turned out, the battery light suddenly went out once he was able to drive at a higher speed on a tarred road. Problem solved and now he is the proud owner of a spare battery. The Land Rover was collected by low-bed the following day and transported to Aliwal North. Fortunately Anwar is covered by insurance. The estimate so far is R130,000 so the insurance company have written it off. You only have one life – Live it! Or as a well known saying goes - If you’re not living life on the edge, you’re taking up too much space. Mike Leicester - group leader of Team M for major involvement in the planning of this tour and especially for the route planning; for supporting all the downed bikers on Bastervoetpad (even those not in our group); for managing the recovery of the BMW; for ensuring all those involved in the recovery completed the Ben 10. Richard Heathcote - for ensuring the safety of the Land Rover on Day 2 after the punctures; for loaning his Land Cruiser to recover the BMW; for being an absolute old school gentleman throughout the tour. Mark Ilbury - for assisting anyone who needed help from puncture repairs to helping out with lifts - always cool, calm and measured; for transporting Anwar and his family all the way back to Cape Town. Charon Roberts - for always being there to support me. All tour participants - for anyone who contributed even in the smallest way to assist others during the tour. Supa Quick in Elliot - for excellent service and going the extra mile. 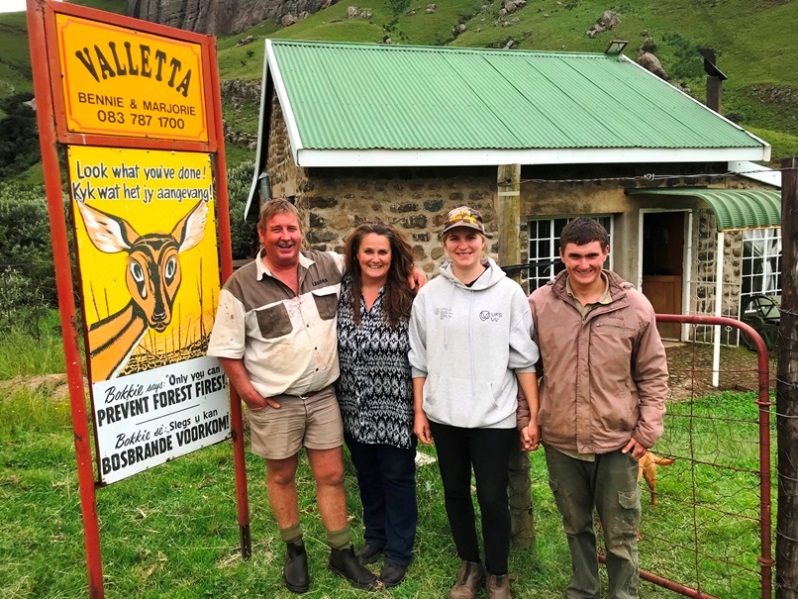 Bennie and Marjorie Venter of the Valletta farm for their spontaneous hospitality and kindness. Natie from the Isuzu group - for classic Afrikaans courtesy, respect for elders and for being a true South African gentleman. Tiffindell Ski Resort - for the welcoming party and lunch treats. Mountain Shadows Hotel - for bending over backwards to meet our every need. Ria and her team are champs!